In 1970 Hodgkinson moved to Melbourne, after a period in Cairns and Sydney, that followed many years of living and working in Europe. He spent a concentrated period experimenting with printmaking techniques with Clifton Pugh. 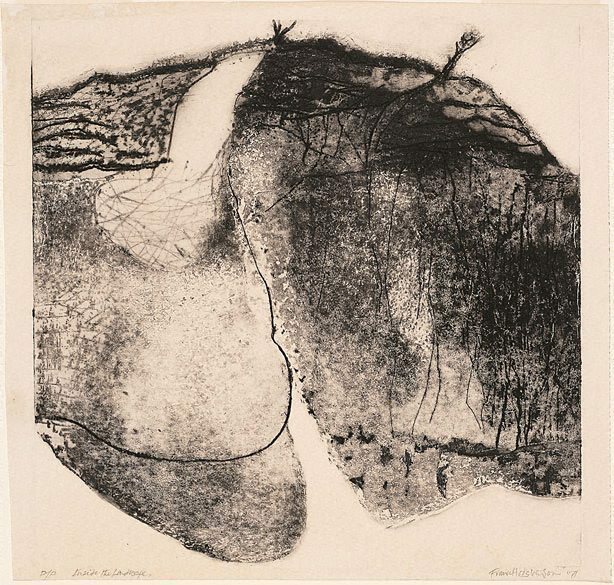 The result was a remarkable series of etchings of anthropomorphic landscapes, inspired by his travels through regional Australia - the Coorong, Flinders Ranges, The Olgas, Cape York, the Glass House Mountains and Tibooburra. The prints reveal Hodgkinson's intuitive and experimental approach, with variations of colour and printing revealing the lengths to which he went in exploring the oil-viscosity method of printing. This method, as demonstrated to him by Pugh, is a distinctive technique pioneered by British artist S.W. Hayter at his famous Paris workshop Atelier 17, where Pugh spent three months in 1970, among many other artists and students from Europe, America, Australia and Japan. These prints complement the most interesting and innovative prints produced in Australia in the early 1970s, sharing thematic and visual qualities with Brett Whiteley, George Baldessin and Fred Williams. Hodgkinson's prints from this series were not editioned in significant numbers and thus remain relatively little known or appreciated within his oeuvre. Their inclusion in an exhibition at the NGA, Canberra ('Landscapes in sets and series', 6 August - 21 Nov 1999) alongside the prints of Janet Dawson, Lloyd Rees, John Olsen, Fred Williams and Salvatore Zofrea brought them to new prominence. Signed and dated l.r., pencil "Frank Hodgkinson ‘71".